Nick Blackwell says he is getting "better by the day" after surviving the "toughest fight of his life". 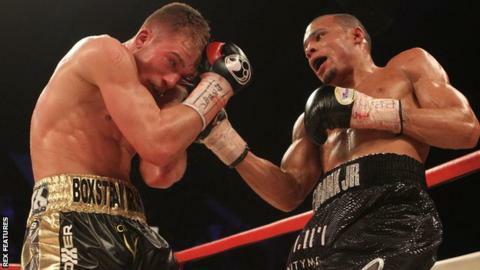 The 25-year-old boxer suffered a bleed on the skull and was placed in an induced coma after losing his British middleweight title to Chris Eubank Jr.
"Just want to say a massive thank you to everyone who has been there for me," said Englishman Blackwell, who woke from his coma on 2 April. "It's been the toughest fight of my life and you made it that bit easier." Writing on his brother's Facebook page, he added: "All my friends and family, those who wished me well and those who raised money for me. I couldn't have done it without you." Referee Victor Loughlin stopped Blackwell's British middleweight title contest with Eubank Jr on the advice of the ringside doctor, who said Blackwell was unable to continue because of swelling over his left eye. After the fight, Blackwell received medical attention in the ring before being taken away while receiving oxygen. The British Boxing Board of Control said it was satisfied with the way the fight was handled. Respected trainer Adam Booth told BBC Radio 5 live that Loughlin had "acted immaculately", while former world champion Barry McGuigan, now a promoter, said it was an "isolated incident" and "nobody was to blame".